My love for the ocean has been my teacher. Its richness of minerals which are derived especially from seaweed, provide many healing benefits to our skin and body. Mermaid Beauty Skin Care is an exquisite natural skin care line that captivates your senses with pure essential oils, Hawaiian Seaweed, flower waters (hydrosols) and botanical ingredients. 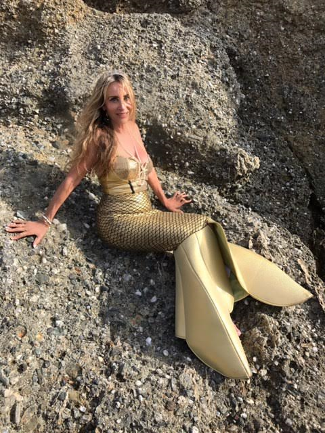 Twenty-eight years in the health and beauty industry inspired my creation of Mermaid Beauty Skin Care. This passion began in High School after six months on a healthier diet plus vitamins left a noticeable difference. Radiant skin, thicker hair, and stronger nails made a believer out of me! Health and beauty are interconnected. I knew I had found my life's work and soon began teaching health lectures and seminars. My quest for knowledge in the health and beauty field grew to include the healing arts of yoga, meditation, and massage. Then, while working at a spa in Hawaii, I received my first facial. It was an alchemical moment, which ultimately led to graduation with honors from (Aveda) Horst International Center of Esthetics, one of the best aromatherapy schools. The real education began. Encouraged by further study with international educators and healers, the glorious day came when I had the vision to create my own skin care line. After years of personally using different seaweed skin care products, I was dissatisfied with the added ingredients of synthetic perfumes and chemicals which were an irritant to my skin. At this point, I decided to create a natural seaweed skin care line, made on Maui, using Hawaiian Seaweed. This idea gave birth to Mermaid Beauty Skin Care, using the highest quality natural ingredients, with pure essential oils distilled on Maui, leaving your skin rejuvenated and radiant.................as if kissed by a mermaid.